Abdullah Ibrahim is arguably the most important musician to ever come out of South Africa but it’s doubtful that many jazz fans are familiar with him. Now 80, Abdullah Ibrahim has been making his own original style of music for over six decades. He is unique in the world of jazz as a composer and player who effortlessly blends African melodies and rhythms with African-American spirituals, Ellingtonian orchestrations, Monkish angularity, Basie swing, as well as a deeply spiritual side from the early influence of John Coltrane, his conversion to Islam, and his 50-year study of martial arts. Primarily a pianist, he also plays saxophone, flutes, cello, drums, sings, and composes for films and symphonies as well as for his many groups and solo projects. Ibrahim’s home of Cape Town shares similarities with New Orleans, both port cities that attracted people across a diaspora who added their flavor to the indigenous culture. He grew up hearing Christian hymns, township jive, Debussy, as well as Cape Malay carnival music, Khoi-san songs (i.e. Bushmen), the rich South African choral tradition, and American jazz. All these influences came together in a thriving cosmopolitan neighborhood called District 6. It was a city within a city where the music created there provided some release from the tremendous oppression that was the apartheid system. When the white government imposed the Group Areas Act, District 6 was essentially bulldozed and black and mixed race people were forcibly moved into townships. For his family that place was Mannenberg, the Cape Town equivalent to the infamous Johannesburg ghetto Soweto. Denied admittance to both medical school and music conservancy because of his race, he was largely self-taught, first performing with dance bands as a singer and then pianist. Once he discovered Bebop and improvisation in the 1950s there was no turning back. For a long time it was a lonely road he bravely traveled as he developed his identity. Of the many great jazz musicians of his generation, Ibrahim is foremost in maintaining his connection to Africa. His music both in terms of composition and in song titles built not only on South African’s own precursor to Jazz (Marabi) but carried on a kind of anti-colonial campaign for African liberation, spurred on by his relationship with the pioneering ‘free jazz’ players—Ornette Coleman, John Coltrane, and Don Cherry. His composition ‘Mannenberg (Where It’s Happening)’ was recorded just prior to the huge student uprising in Soweto in 1974 and became the unofficial national anthem. Discovered and recorded by Duke Ellington while living in exile in Zurich in 1963 under his then-name Dollar Brand, Ibrahim had to initially record on the German label Enja in order to get his music released anywhere. 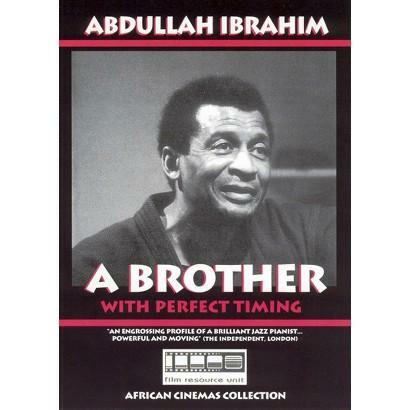 “A Brother with Perfect Timing” (directed by Chris Austin) was filmed in 1986, four years before Nelson Mandela was released from prison and eight years before South Africa was finally freed from the apartheid regime. The documentary tells a story that is both complicated in structure and easy to follow. Throughout the film Ibrahim plays different roles. At times he is the narrator, telling stories and sharing anecdotes, cultural and musical history lessons, offering metaphors, and even jokes for how he and other musicians developed and grew into being. He demonstrates compositional ideas on a piano in his apartment in New York City. He is seen performing with his septet Ekaya at the Manhattan nightclub Sweet Basil, as well as rehearsing a choral group. Some scenes in South Africa feature actors dramatizing events that Ibrahim recounts. The music is at times jaunty and danceable, other times a complex brew of post-bop and modal blowing, as well as being profoundly tender. The close-ups of the musicians and singers add to the energy of the music. The group included Carlos Ward on alto and flute, Ricky Ford on tenor, Charles Davis, baritone, Essiet Okun Essiet on bass, and drum work shared by Don Mumford and Ben Riley. Abdullah Ibrahim has always been an uncompromising musician. Self-exiled from his home in 1962, he has simultaneously inhabited the worlds of an African traditionalist and a modernist. He draws heavily from his martial arts training to outline the parallels between the life of the samurai and an improvising jazz player. Both require a sense of fearlessness and willingness to make the most out of the moment, including any ‘mistakes’ that might happen while playing. In his life and throughout the film Ibrahim creates music that is far more than entertainment. He sees it as a healing force and brings an utmost seriousness to his creativity. Some find him hard to work with while others marvel at the mystery he is able to tap into. The concept of ‘A Brother with Perfect Timing’ refers to the naturalness of Africans who can make adjustments in split seconds without losing a beat. The film offers insights into this complex musician and his lifelong efforts to use his music to move the human heart and build a better world.